Late summer in Tennessee generally means low clear water in the mountains and a mix of high and low water on the tailwaters. TVA begins to draw down reservoirs to winter pool about this time of year if necessary, but otherwise the tailwaters are low and clear. Last week brought a departure from the norm on the Caney. Recent generation has consisted of a two hour pulse at some point in the morning, but heavy rains that brought flooding to parts of the state affected the lower end of the Caney Fork. Water levels in Center Hill Lake have come up some, but mostly the lake was spared from the worst of the onslaught. The tailwater is a different story. Last Thursday, it was obvious that large quantities of mud had entered the river somewhere upstream of Happy Hollow. I fished at Happy for probably a couple of hours and caught a decent number of fish despite the water conditions. When I first pulled into the parking lot, I almost didn't even bother to get out of my car. Upon closer inspection though I noticed dark patches indicating the weedbeds under the surface. Realizing that the water was just very off color and not chocolate milk, I proceeded to rig up a four weight and headed down the ramp. The clarity of the water made simply searching the water much less productive than it normally can be. I've seen fish move up to 7 or 8 feet to take a Zebra Midge on the Caney, but this time the fly would have to be within a foot or two of the fish for them to even see it. Careful observation is key to success in life, and fishing is no exception. After standing on the bank for 10 minutes, I located several risers and slowly started to wade in their direction. Once within range, it was a simple matter of waiting for the fish to give away its location by rising and then casting to it. Most fish would hit within the first few casts although a few took upwards of 10 or 15 casts before eating. Still, I can't complain about those numbers. My Smokies excursions tend to be limited to the Tennessee side of the ridge. Obviously that is a result of proximity but also of familiarity. The comfort of fishing my home water keeps me coming back time and again. Over time I have learned the river almost like the back of my hand. At this point, the main challenge has become chasing the larger browns in the river. Ironically, every trip to the other side of the Park tends to produce a memorable moment. 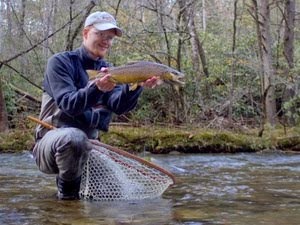 On Little River it is easy to fall into the trap of routine, but I retain some of the suspenseful excitement of fishing new water on North Carolina streams. 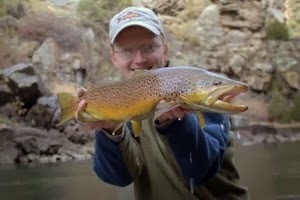 This past weekend I headed up to fish the Park with the plan to meet my buddy Joe Mcgroom. After a late start, I finally was rolling up Little River a little after noon and found Joe's truck near a favorite stretch of water. After some consultation, we checked out a couple of spots on Little River before deciding to head over the ridge. The trip up and over Newfound Gap was faster than you can normally make it during peak vacation months. There was a noticeable absence of lost tourists stopping in the road which was a nice change from the norm on Park roads. Rain was developing over the higher elevations, a warning of things to come. We developed a game plan while en route and finally stopped along the Oconaluftee River. Joe had a definite goal in mind and our first stop put us at a nice pool that can produce some better than average browns on occasion. I was not ready to fish yet and told Joe to fish the pool while I rigged up. We both started with the usual double nymph rig. As I tied on some fresh tippet and selected flies, Joe worked methodically through the pool. Nothing happened until he hit the head where fish often feed in the low water of late summer. 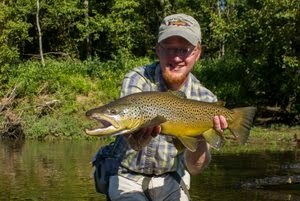 Finally a solid fish struck the fly and the excitement started. I watched as Joe fought the fish downstream into the slower portion of the pool and finally corralled it in the shallows. Interestingly, in addition to Joe's flies, the fish also had a short section of tippet and small nymph in its mouth, obviously the victor in another recent fight. 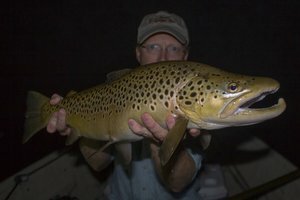 After freeing the fish from its unwanted jewelry, we snapped a couple of pictures and then Joe spent a few moments reviving the nice 14 inch brown. First pool success is often a sign of slow fishing for the rest of the day and this trip didn't deviate from that standard. More than anything, I think our own laziness set the pace for the rest of the day. We both caught several more fish but nothing out of the ordinary and the catching was definitely not as good as it could have been if we were more focused. Sometimes its nice to have slow days though. Really all I wanted out of this trip was the chance to get out on the stream, and any fish caught were just a bonus. A little later in the day the rainfall from higher elevations finally caught up with us and the water turned muddy. Fish still fed just fine, but after fishing in the higher water for a little while, we decided to call it a day and head back over the ridge. As we head into the late summer months, I feel a word of caution is needed for anglers everywhere, myself included. When a large trout (or any other species) graces the end of your line, the urge to take plenty of pictures is strong. I would like to recommend being as careful as possible when doing so. This issue is a problem and one that has been painfully obvious on my last two trips to the Caney Fork River. Both times I have found large brown trout dead on the river bottom. Each fish was obviously healthy and probably in the prime of its life. I know that after a certain point the fish die of old age, but these fish were not to that point in my opinion (although I clearly cannot say that positively). I have a couple of theories on how those fish died. One is that someone caught them and simply played the fish too long and then kept it out of the water for too long during the picture session. Another possibility is that someone put the fish on a stringer before thinking better of the idea. The new regulations allow the harvest of only one brown trout over 24 inches. The first fish I found dead was around 18" and the fish yesterday taped out at 22". Both were under the minimum size limit and someone may have got nervous and slipped the fish off the stringer as they approached a major access point. However, the fact remains that some fish we catch probably won't make it. To greatly increase the odds of the fish surviving, please remember to always wet your hands before touching any fish. Also keep the fish in the water as much as possible between photographs. There is no need to have the fish out of the water for very long. Don't place the fish on dry surfaces for those "beside the rod" shots. Finally, when in doubt, get the fish back in the water and skip the pictures instead of killing the fish. I've done this with some large fish, and never regret the decision. On the Caney, low dissolved oxygen levels have been reported lately. The river is currently only a shadow of its former self. 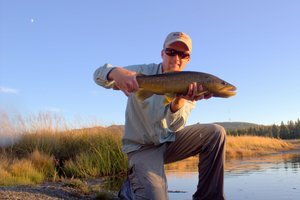 If you should be fortunate enough to hook and land one of the rare large fish that are left, please treat it respectfully and get it back in the water as quickly as possible. Spend as much time as necessary reviving the fish. This is particularly important with the oxygen problems. Get the fish out in the main current away from the warmer water near the banks. While my motivation for bringing up this issue was two experiences on the Caney, this is something that everyone should be careful of as we continue through the hottest months of the year. Fisherman everywhere should consider their impact on the resource and fish responsibly at all times. I've stayed away from the lower reaches of large Smoky Mountain streams this summer because of the warm water. The long term health of the fishery is much more important to me than possibly catching and killing a large brown.